Rock Point Homes President Gabe Thomas. Gabe Thomas grew up on construction sites with his father's company, Thomas Builders in Athens, Tennessee. Those early years created a foundation for his passion today: enhancing people's lives through their home and community. Thomas, the 36-year-old president of the newly formed Rock Point Homes, didn't initially pursue his building passion, however. 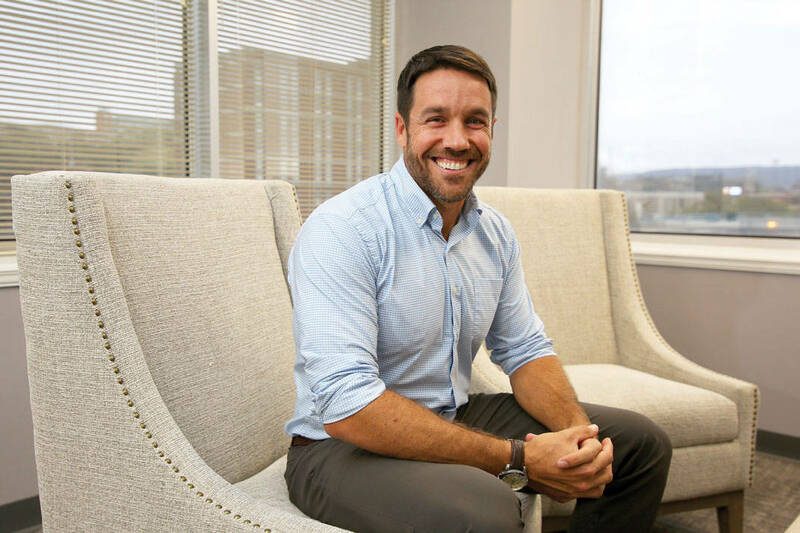 While earning a business degree from the University of Tennessee at Chattanooga, Thomas worked in the proof department of the former AmSouth Bank and decided to become a banker. He spent nine years in banking, first at Regions Bank in Chattanooga and, after earning his MBA from Tennessee Tech University, at Community National Bank in North Georgia. Thomas was considering another banking job in the Nashville suburb of Franklin six years ago when he an his wife drove through a neighborhood known as Westhaven., a subdivision built on traditional neighborhood designs with condos,townhomes and single-family, detached homes. "I saw that and decided right then this is really what I want to do: to build homes and a community like what I saw at Westhaven," he recalls. So in 2002 Thomas joined Collier Construction, where he was a partner with Ethan Collier and head of development. Thomas helped locate and develop such projects as One Hundred at South Broad and Waypoint South on the Southside and Reside North and Camber Hill in North Chattanooga. Thomas also became active in the home building industry as vice president of the Home Builders Association of Chattanooga. Thomas combined his financial background in banking and his early building and development work with his father to also launch a real estate development and investment firm with Realtor Jason Farmer in early 2016 known as GBO (short for "Go Big Orange") LLC. In August, working out of the GBO downtown office, Thomas joined with two other managers from Collier Construction — Dustin Douglass, and Bryan King — to form their own home building and residential development company, Rock Point Homes. Their first venture, Signal Farms, is a 26-home modern farmhouse community on Signal Mountain.that will include modern farmhouse elements such as front porches, half acre plus lots, site finished hardwood floors and spacious kitchen islands. Thomas and his wife have two daughters and he says he is motivated not by just by building homes, but creating communities for families like his. "I take a lot of pride and get a lot of value and enjoyment out of creating great places for people to live," he says. "It can be hard with a lot of challenges. But if we do it right, we can really impact people's lives because a well designed neighborhood with great homes can definitely improve people's lives."